Dubai: The emirate of Ras Al Khaimah witnessed the heaviest rains on Sunday that led to the failure of traffic lights, flooded roads and wadis overflowing with water. When officer Salem Hussain Al Huti rushed into the water to help stranded motorists who were stuck on the road that was filled with water, little did he know that his heroic act would become an internet sensation – getting the attention of His Highness Shaikh Saud Bin Saqr Al Qasimi, Member of the Supreme Council and Ruler of Ras Al Khaimah. 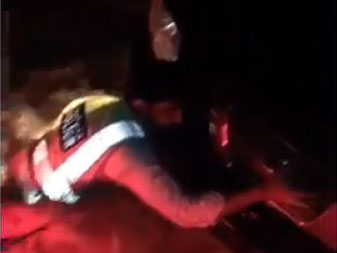 A video that went viral on UAE social networking sites showed officer Al Huti waist-deep in water as he braved the lashes of rain, and helped push a vehicle and its passengers to safety. In total, Al Huti successfully rescued eight passengers to safety who were trapped in Wadi Beih. On Tuesday, Shaikh Saud tweeted a message to Ras Al Khaimah Police, praising the courage of the police force and the efforts of officers who risked their lives during the thunder storm. “I have great pride in the officers of Ras Al Khaimah Police for their ceaseless efforts to maintain a safe and secure community for everyone and for their commitment to assisting the needy in every situation,” wrote Shaikh Saud on his official Twitter account. The Ruler of Ras Al Khaimah then went on to single out officer Al Huti, who demonstrated courage and heroism in the line of duty. "This week we witnessed an act of heroism from our son Salem Hussain Al Huti, of Ras Al Khaimah Police, who showed great courage when he risked his life to save eight people trapped in their vehicles in Wadi Bih. He did not hesitate to venture into fast-running water to help them and, with the assistance of his colleagues, deliver them to safety".